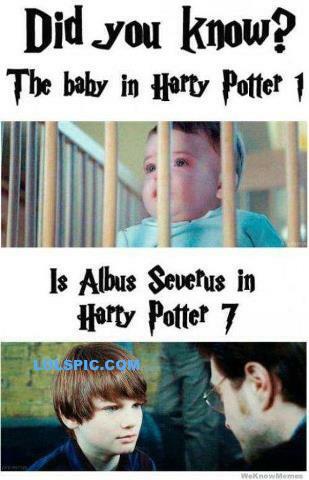 Albus Severus Potter's actor was Arthur Bowen, and baby Harry Potter is credited as the Saunders triplets. Neither appear to have anything in common over at IMDB, either (Bowen, Saunders), but Saunders may not be their real name..? And sadly, Bowen doesn't have a Wikipedia page - if you try to look him up, it redirects to List of Harry Potter cast members#Epilogue characters. Sooo, anyone have more information? Is Arthur Bowen one of the Saunders triplets, or is someone just pulling one over on us? That pic is not from HP 1 -- it's from HP 8, from the Snape's memories scene. The baby shown in the original meme is named Toby Papworth. The babies named in HP 1 are the Saunders triplets. So the answer has to be no, Toby Papworth, the Saunders triplets, and Arthur Bowen (Albus Severus Potter) are not all the same person/actor. 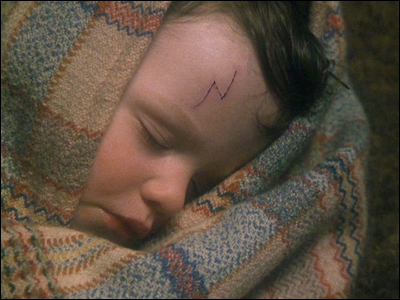 Above is baby Harry, one of the Saunders triplets, in Harry Potter and the Sorcerer's Stone, which was released in 2001. 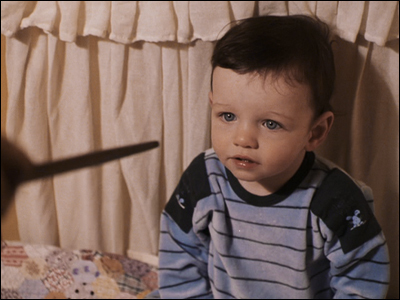 As a little bit of trivia, baby Harry in Sorcerer's Stone is wearing a striped Blue's Clues romper/pajama set while sitting in his crib as Voldemort approaches. Blue's Clues didn't exist in 1981. 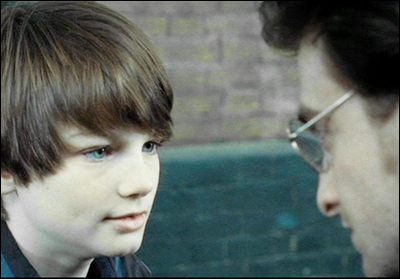 Above is Arthur Bowen, the actor credited with playing Albus Severus Potter in Deathly Hallows 2. Not only is his name completely different than the actors who played baby Harry in Sorcerer's Stone, but his eyes appear to be a lighter blue than the Saunders triplet pictured, and he seems to have a cleft in his chin when the Saunders triplet does not. 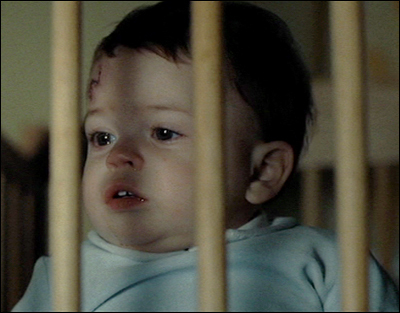 And above here is baby Harry in Harry Potter and the Deathly Hallows Part 2, which was released in 2011. This is Toby Papworth. You'll notice baby Harry in Deathly Hallows 2 is not wearing a striped romper like he is in Sorcerer's Stone; In Deathly Hallows 2 his romper is plain light blue. As well, the cut on Harry's forehead is more pronounced in the Deathly Hallows 2 scene than in the one from Sorcerer's Stone. Toby Papworth also does not appear to have a cleft in his chin as Arthur Bowen does. Not the answer you're looking for? Browse other questions tagged harry-potter actor-identification or ask your own question. Harry Potter: Who owns the Riddle house? Why didn't Severus Snape from Harry Potter kill Nagini? Who died in Harry Potter?